An honest and open account of his training, nutrition and steroid cycle for his bodybuilding show. Mark Bell is an American professional powerlifter, patent holder, owner of Super Training Gym, and a former professional wrestler. His best lifts in competition (in powerlifting gear) include a 1,080 lb (490 kg) squat, a 854 lb (387 kg) bench press, and a 766 lb (347 kg) deadlift; he has also managed a 578 lb (262 kg) raw (unequipped) bench press. He recently made a switch and documented his project to train for a Bodybuilding show. Below he talks openly about his steroid use in both Powerlifting and Bodybuilding. 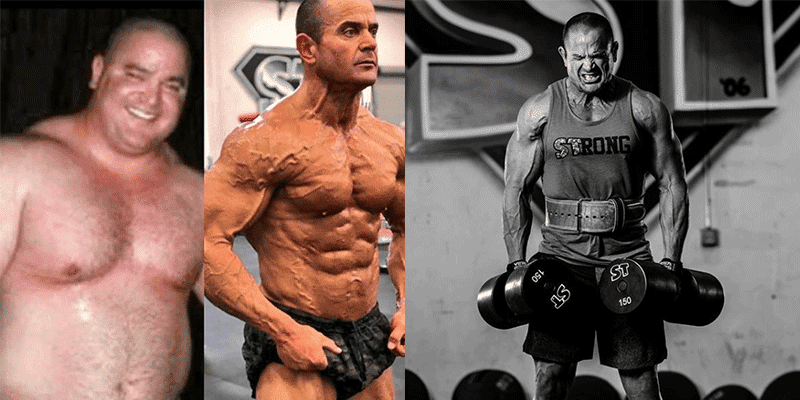 Mark Bell runs the hugely popular Supertraining Channel on youtube where he trains with top athletes and coaches from all around the world such as Louie Simmons, Brian Shaw and CT Fletcher. CT Fletcher as You’ve Never Seen Him Before! You can make changes. And guess what, it may take time. These pictures are 10 years apart. — The same improvements I made with my physique are the same improvements I made as a husband, a dad, a friend, a business owner, a mentor and as a coach. — 50% of these results are from the actual lessons I learned from the gym and all the people I interact with in fitness. — What a lot of MEATHEADS miss out on are all the lessons that must be learned outside the gym but inside of yourself. — Self esteem, and self respect are two very powerful things to build upon your own personal development. But without this personal development you will never be able to hold on to your gainz long range. You will certainly not be able to progress past your best and hang on to it. — If you been following along you’ll notice in this 10 year span all of this happened in many stages. That’s because even though I was able to progress I wasn’t ready to hold on to the success. – It can’t be fake – It can’t be outsourced – It has to be done by you – It has to be done for you – And you must learn from it – Lastly remember this! – Anyone can be excited for 2-3 month – A few can stay excited for 2-3 years – A winner will stay excited for however long it takes to win!